After Hudson adopted a unified school district in 1896, a number of local school houses were purchased and converted into private dwellings houses. 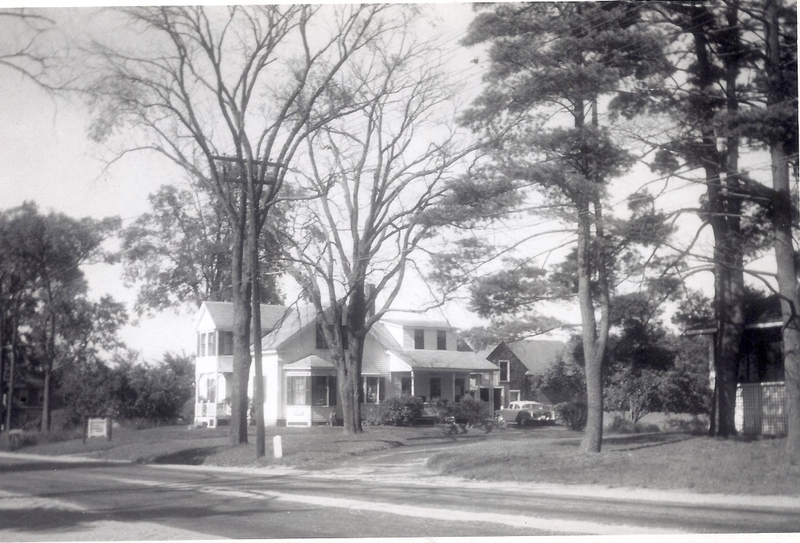 Such was the case with the house shown in this 1956 photo. The #6 (Farms District) school house was built in 1852 on what is now the vacant lot just north of 107 Derry Street and almost opposite Hudson Hardware. By 1898 the school house was converted into a dwelling by Menzell French. It remained in the French family until destroyed by fire in January 1980. For years this was the home of Harold and Maude French and family. Harold began The French Insurance Agency in the front room of this home; notice the sign along Derry Street. Maude is fondly remembered for her work with the 4-H clubs, Fortnightly Club, and her prominent role in securing funds for and the beginning of Alvirne High School. The insurance agency was continued by their son, Gordon, and now by grandson Rick and family at 12 Derry Street. Photo compliments of the French family and now a part of the Historical Society Collection. By Ruth M Parker in Derry Rd, Schools on February 27, 2015 .